Should Doctors Save A Man With A 'Do Not Resuscitate' Tattoo? Should Doctors Save A Man With A ‘Do Not Resuscitate’ Tattoo? This might sound like the kind of hypothetical conundrum you’d face in an undergrad philosophy class, but it’s exactly what happened at Miami’s Jackson Memorial Hospital. Hospital staff were shocked to discover the tattoo, and initially baffled as to how to treat the man. In other words, it’s possible the patient may not have been doing great for a while. As for the tattoo, Holt explained he had his own set of fears that the message might not be an accurate representation of the man’s desire. “Tattoos might represent permanent reminders of regretted decisions made while the person was intoxicated,” Holt noted in an article on the event in The New England Journal of Medicine. Of course, that’s only the start of the ethical rabbit hole. What if the tattoo was just some kind of joke? Could it simply be the name of the patient’s favorite obscure metalcore album? Was the patient even in a sound state of mind? What if the tattoo had indeed been initially intended as a serious message, but the patient had since changed his mind? At this point, the emergency staffers turned to the law for guidance — and found nothing. Do not resuscitate (DNR) orders are usually carefully managed affairs and can be complex. While critics argue the process is unduly difficult to undertake, advocates of the DNR status-quo argue the decision itself should be far more difficult than the paperwork it can create. As for attempts to circumvent the need for an official DNR, Holt said tattoos aren’t a good option. “This patient’s tattooed DNR request produced more confusion than clarity, given concerns about its legality,” he noted. The patient was put on treatment, but Holt said the decision didn’t sit right. “This decision left us conflicted owing to the patient’s extraordinary effort to make his presumed advance directive known; therefore, an ethics consultation was requested,” he explained. In the end, the hospital drew up an official DNR for the man, whose condition deteriorated as the night wore on. “He died without undergoing cardiopulmonary respiration or advanced airway management,” Holt finished. 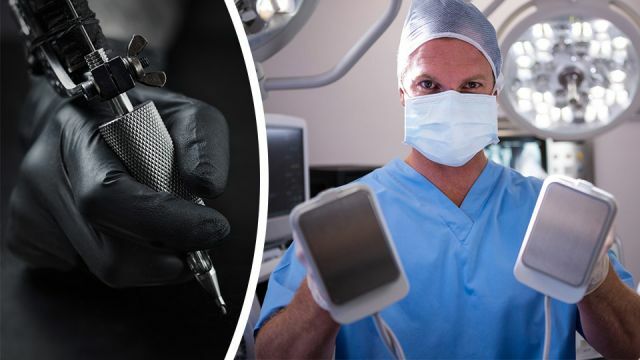 Although the patient was never able to give his final words, a further investigation found the tattoo could have been far from the patient’s only attempt to make his last wishes heard. “Subsequently, the social work department obtained a copy of his Florida Department of Health ‘out-of-hospital’ DNR order, which was consistent with the tattoo,” Holt said. The state DNR order may have retrospectively made the decision clearer, but Holt concluded by arguing the tattoo didn’t make the initial choice any easier. “Despite the well-known difficulties that patients have in making their end-of-life wishes known, this case report neither supports nor opposes the use of tattoos to express end-of-life wishes when the person is incapacitated,” he said. What do you think? Are DNR tattoos a clear-cut way for patients to make their dying wishes heard, or do they simply make a difficult situation even more difficult? Let us know in the comments below. Hey Buddy!, I found this information for you: "Should Doctors Save A Man With A ‘Do Not Resuscitate’ Tattoo?". Here is the website link: https://www.thealternativedaily.com/should-you-save-a-man-with-a-do-not-resuscitate-tattoo/. Thank you.